Defined by the Payment Card Industry Security Standards Council (PCI SSC), the standard was created to increase controls around cardholder data to reduce credit card fraud. Validation of compliance is done annually - by an external Qualified Security Assessor (QSA) for organizations handling large volumes of transactions, or by Self Assessment Questionnaire (SAQ) for companies handling smaller volume. PIN Transaction Security (PTS) requirements. 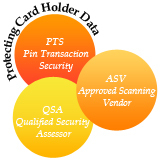 PCI DSS applies to any entity that stores, processes, and/or transmits cardholder data. This workshop is meant for professionals responsible for PCI-DSS implementation / compliance in any organization. In general, all entities that store, process or transmit card holder data are required to comply with this global data security standard which covers rules about encryption and protection of card data.